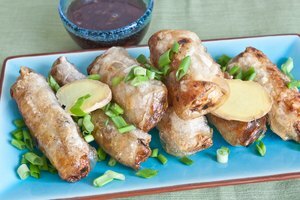 Crisp, savory spring rolls are a staple finger food at Thai and Vietnamese restaurants, and they're easy to make at home. Unfortunately there are two very different kinds of spring roll skins, and they're used in different ways. 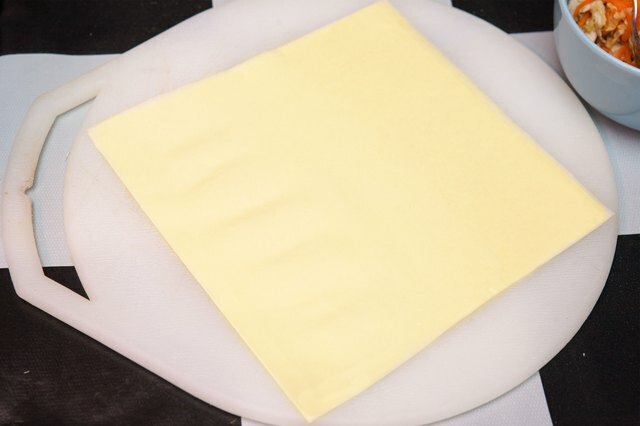 Rounds of rice paper are most common in Thailand and Vietnam, but restaurants in the U.S. commonly use squares of wheat-based dough. Both are valid options, but they're used in different ways. 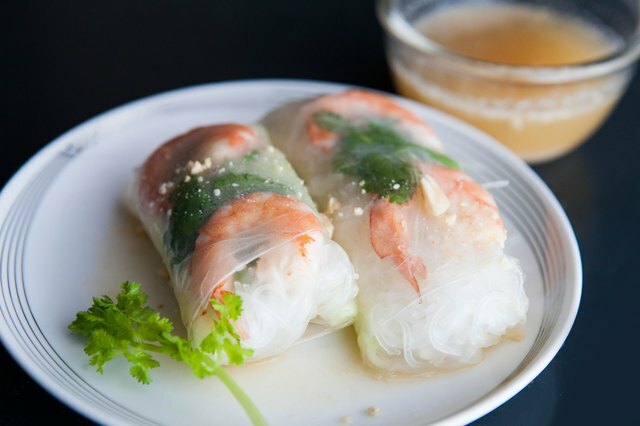 Rice paper spring roll skins are sold in sizes ranging from 6 to 12 inches in diameter, but the 6- and 8.5-inch size are best for spring rolls. 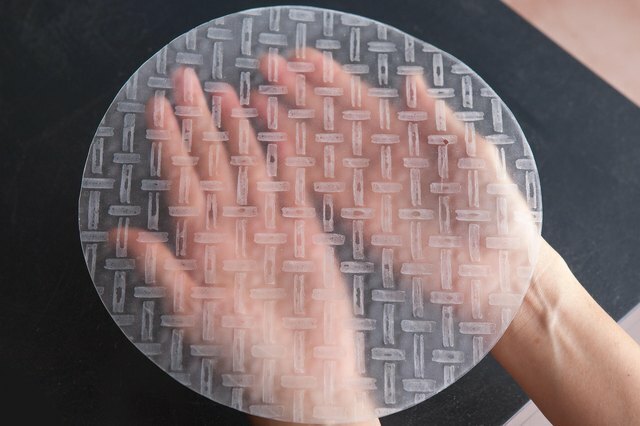 Dip your rice paper rounds one at a time into warm water, just for a few seconds, then lay them out an a clean workspace. 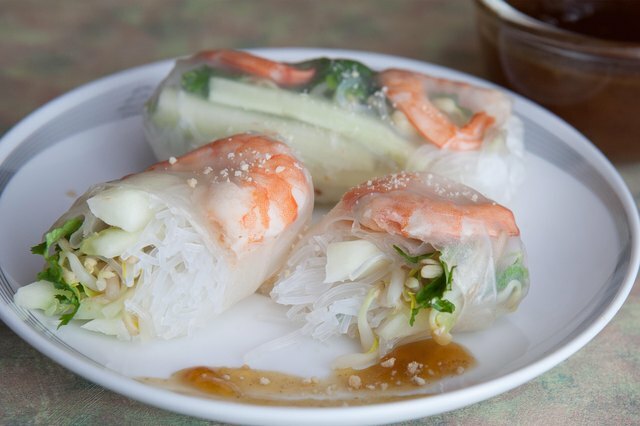 Form a cylinder of filling, 3 to 4 inches long, across a third of the rice paper wrapper. Fillings can include any combination of bean thread or "cellophane" noodles, julienne vegetables, herbs, chicken, pork or shrimp. Fold the bottom edge of the round over top of the filling, then fold in the sides -- as you would with a burrito, to trap the filling -- then finish rolling the rice paper into a cylinder. It will stick to itself without assistance. 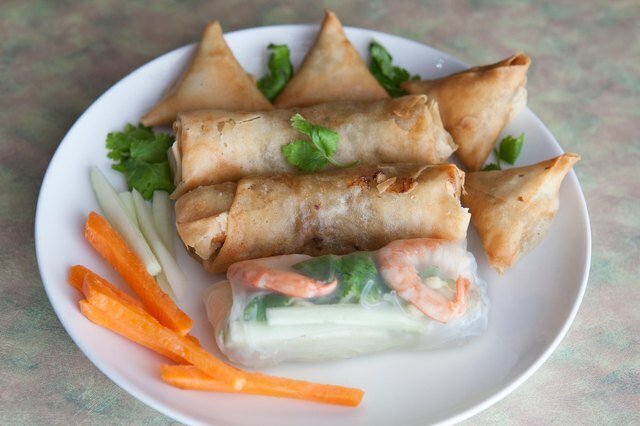 Spring rolls are typically deep- or shallow-fried in oil until hot and golden, but the same wrappers can also be used to make uncooked "summer rolls." Also known as garden or salad rolls, these can contain lettuce and other delicate vegetables that would be damaged by cooking. Roll them the same way as spring rolls, using small rounds for finger-sized rolls or the big 12-inch rounds for rolls that can be sliced into finger-sized, sushi-like rounds. 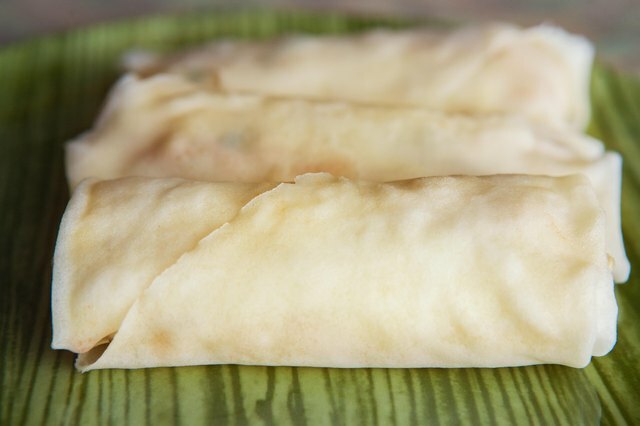 The wheat-based spring roll wrappers used in many restaurants are similar to wonton wrappers, but thinner and -- at 8-inches square -- much larger. 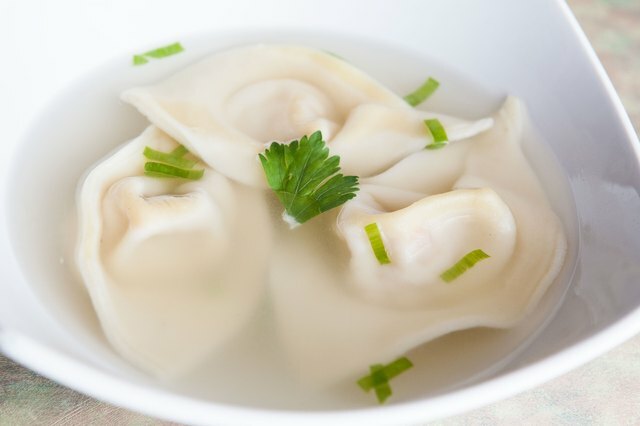 They don't need to be soaked before use, but they're often sold frozen and should be thawed overnight in your refrigerator before they're used. Start by placing one on your work surface, with a corner pointed toward you. Mold your fillings into a rough cylinder 3- or 4-inches wide, across the lower third of the wrapper. Fold the bottom point of the wrapper over the filling -- it will overlap by a couple of inches -- and mold it tightly to the filling, squeezing out any excess air. Fold the sides in to seal the filling in place, creating a shape like a mailing envelope with the flap open. 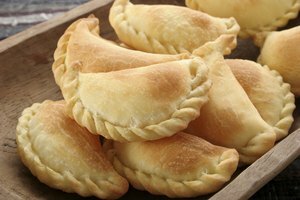 Brush the "flap" with a thin paste of flour or cornstarch mixed in water, then roll the cylinder of filling to the end of the flap. 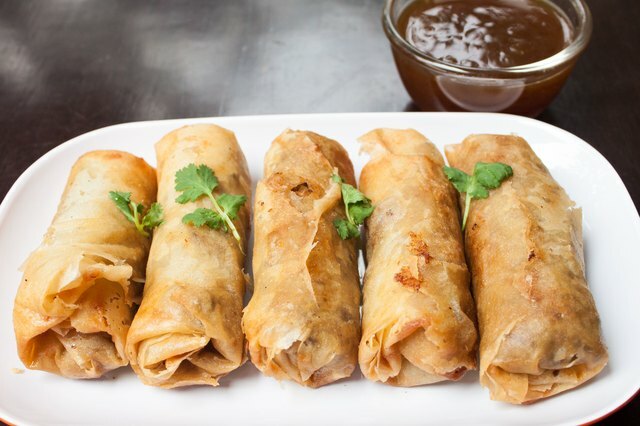 Like their rice-paper equivalents, wheat-wrapper spring rolls can be fried in either deep or shallow oil until golden. If you prefer a lower-fat alternative they can also be misted lightly with oil and baked in a 400 degree Fahrenheit oven. Leftover wheat-flour wrappers are a surprisingly versatile ingredient. Cut them into triangles and fry or bake them as a dipping chip. Alternatively, cut the wrappers into narrow strips before crisping them, and use them as a salad topping. They're especially tasty if you toss them with your favorite spices while they're still hot. If you want a sweet snack, brush strips or triangles of the dough with melted butter, and sprinkle them with cinnamon sugar before you bake them. 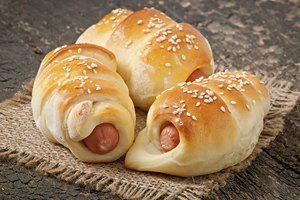 If you stop thinking of them as spring roll skins and consider them instead as ready-made pastry, other options will quickly come to mind. For example, you might fill the rolls with fruit to make miniature strudels, or fold them into triangular fruit mini-pies. 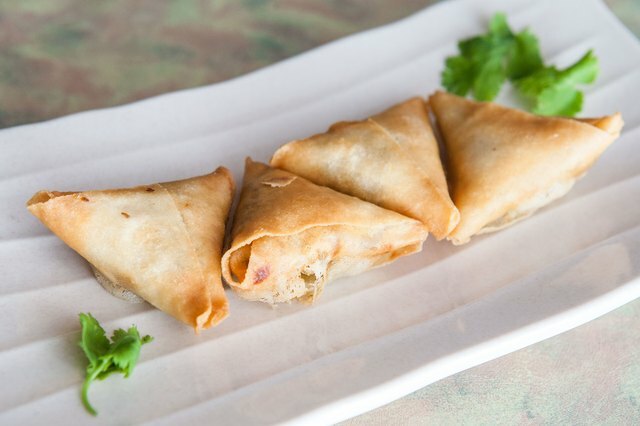 The triangular shape also works for individual spanakopita or samosas, which are different -- but interestingly so -- when made in spring roll wrappers. Your big square sheets of dough also make a fine substitute for fresh pasta. Cut each 8-by-8-inch square into four 4-inch squares, and use them to make large ravioli or capelletti. Left whole, they can be used as cannelloni wrappers or lasagna sheets. They won't need pre-cooking, because they'll absorb as much moisture as they need from your sauce. If you wish, you can make two spring rolls from each wheat-type wrapper by cutting it in half into triangles. Shape your filling near the bottom edge of the triangle, and fold the points in from either side to enclose it. Then foll from the bottom edge to the tip of the triangle, sealing the wrapper with the same flour or cornstarch paste. Spring rolls made this way are smaller, lighter and less crunchy than their larger full-sheet counterparts, and make good appetizers or party food. 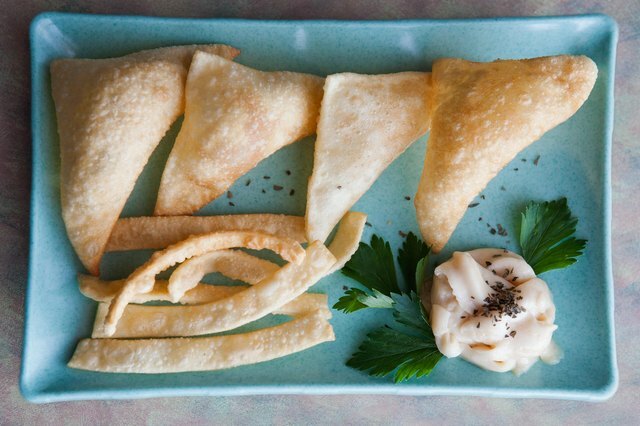 Can You Deep Fry Phyllo Sheets?